‘Detroit Nocturne‘ found here. Via Mick Hartley. Immediately, I think of Edward Hopper: The lonely cityscape at night or the familiar glow of gas station lights cast into the American wilderness. The eye might want to linger among the colors, shapes and clouds even though the mind knows this is pretty much an empty street in a ‘post-industrial’ zone. The individual artist is quite alone in the task he’s set before himself, and like much of modernism, it’s a rather big task. Do you believe any of that to be of vast import to the nation? Are you no one? Perhaps I’m not wrong in having called Halloween horror stills and movie images to mind (it’s my mind, after all, so maybe I’m just thinking of Devil’s Night). I really enjoy the light on the dumpster and the side-front rectory wall. There seems to be a little more mood here, more drama, so maybe Edgar Allan Poe’s ‘psychological intensity,’ his surrealism, and terror are more appropriate for comparison. Poe was a bit mad, after all, despite his fascinatingly untamed and powerful imagination. He achieved a uniqueness and completeness of vision few artists do. Maybe there’s a bit of the sullen, self-aggrandizing earnestness in him of the teenager (J.D. Salinger); the desire to shock, delight and terrify. The mind is as though a chamber, the horror rises to fever pitch, the lush rhyme matches an increasingly desperate search for truth and beauty in the world (Poe had very much his own Romantically inspired metaphysics). Nice photos, Dave. Thank you. 70 photos of the abandoned, foreboding Temple. Mysterious symbols and a certain sad grandeur that’s come to represent Detroit these days. 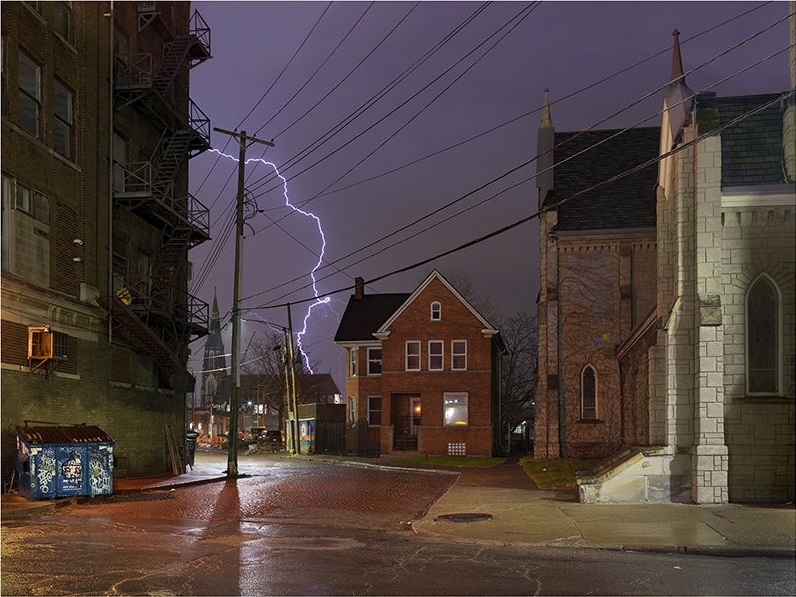 -Photographer Ben Marcin has a series called ‘Last House Standing.’ Solitary row-homes…the only ones left on the block. More from Megan McArdle on the behavior that comes with pension bonuses.Charlie LeDuff, Detroit’s populist, citizen journalist’s youtube channel here. At least he’s sticking around. Two ways around postmodernism, nihilism? : Through postmodernism? One is Allan Bloom Update And Repost: ‘A Few Thoughts On Allan Bloom–The Nietzsche / Strauss Connection’…A structure in the desert…not even a city Update On LACMA, Michael Heizer And The ‘Levitated Mass’-Modern Art And The Public;.